Life is all about uncertainties! And, it reflects in each and every aspect of it. You might be thinking that what am I writing right now?! Well, these are the thoughts came to me by reading the book which I am going to talk about today. 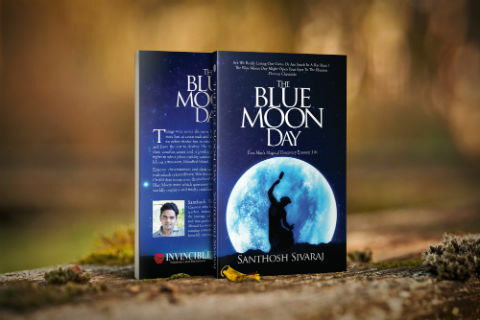 When we were approached by Santhosh Sivaraj to inform about his book The Blue Moon Day (tagline: Five Men’s Magical Discovery Enroute Life), we were not sure about what to expect from the book. 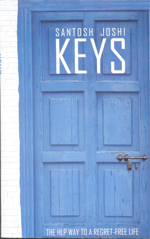 Though the title of the book doesn’t reveal much about the book and its content, the tagline tells a lot about it. However, it is quite possible that a reader understand it after reading the book. The first edition of the book was published in 2017. The book we’ve received is the revised second edition of the same. By the way, the regular readers of ThinkerViews know that all our reviews are personal and unbiased, let me reiterate it here. Despite the fact that the book is provided by the author, the review is uninfluenced by all means. This revised second edition is printed at Thomson Press (Ind) Ltd.
As our purchase decisions are highly influenced by book covers. At least, we tend to flip through the pages of a book with an attractive cover page. This book, The Blue Moon Day, has a moderate cover page. While it is not very attractive, it is good. To remain true to the title, the use of blue and white color with black shades and integration of “moon” sounds obvious. And the designers integrated those elements. It gives you an idea about a paranormal or horror kind of a book. Well, the book has spiritual stuff, but it doesn’t belong to paranormal or horror genre anyway. So, the cover page is ok, but it could have been better. The book explores 5 stories, each has its own attributes. Each of the story tries to convey a philosophy of life which will help us to make it better. While reading the story of The Pizza Engineer, you will meet Abhinav aka Abi. He is a fat guy who studied various streams in his life and got degrees in different field including Management and Technologies. After earning his Ph.D., he is now looking for a job! The job interview was not bad, be he didn’t get the job either. So, he was in a mental state of nothingness, and his enthusiasm was decreasing. Obviously. In the evening, however, he got a call and was informed that a wealthy businessman named Mr. Pillai is looking for an assistant. He was also informed that it would be tricky to please Mr. Pillai. Understanding that it is only chance for him to get rid of his financial worries and starting his professional life, Abi decided to give his best when he meets Mr. Pillai. So, who is Mr. Pillai, and will Abi be able to convince him to accept him as a worthy candidate? The second story The Messenger explores the life of Deepak, a carefree yet enthusiastic youth of the modern day. He and his best buddy Ajay are like inseparable. While their personalities are like chalk and cheese, Deepak can always rely on Ajay as his friend, philosopher, and guide. Ajay takes life very lightly and is even more carefree than Deepak. When Deepak see Priya, he immediately falls for her. He thought that he would not be able to get recognized by her, just forget that she reciprocate his feelings; but, decided to take a chance. Ajay was there guiding him, but of course. Eventually, Deepak and Priya developed feelings for each other and they got married too. But, the real life is not what we had seen in the films or read in books and stories. Usually, in these media, the story ends like “then they lived happily ever after”. The real-life journey starts from that point actually. When you start living with someone 24X7 you are introduced to the weaknesses of the person in addition to his/her abilities. And, then the professional and social stuff takes its own toll on the couple. So, what happens after a couple is married, is the actual story, and the greatest challenge is to make it a “love story”. By the way, what happens to Deepak, Priya, and Ajay after this point, is better to explore by reading it. The third story Not Today is the one which I referred in the very beginning of this article. Vivian aka Vivi is a dedicated employee of his company. He is quite a senior in his company and takes his work even more seriously than one should. He wanted to remain in the good books of his superiors. He reaches the office even before the peon and sits till late. Obviously, by doing this, he was unable to spend the time he needs to, with his family. His wife Jenny is very understanding and so does their cute boy, Danny. But, there always is a limit to someone’s understanding. You cannot take your family for granted. No, neither Jenny nor Danny does any drama to Vivi, as you might be expecting. They are very caring and understanding. Vivi’s this nature makes his boss get more and more done from him. Even his personal work was forwarded to Vivi. What Vivi needs desperately is a break. His family needs to spend time together and enjoy some time at a place where they are not going to be disturbed. Vivi’s leaves are sanctioned with a condition that he will make an important(!) presentation while on the tour and reports his boss on regular bases, and always remain in touch! Will you call it a vacation?! What happens during the trip is the rest of the story. Fourth story The Storyteller belongs to Sankaran. Sankaran is a retired postman. He is living alone. His wife met with his death and since his son Vinod was married to a girl (Khadija) of the other religion, they were not on good terms. In fact, they are not speaking to each other. There comes a time when it becomes almost impossible for Sankaran to live alone. He then decided to admit himself in an old age home. The things were quite different at the old age home than he has expected. The admission and facilities were allocated based on the fees you pay there! Sankaran, based on his savings was able to secure a room in a dormitory there. One day, his luggage got stolen from there! He was now emotionally and financially broken person! He decided to call his son Vinod now, as there is no other way he can survive! What will Vinod do? Will Sankaran be able to get enthusiasm back to live life? Will he be able to share a bond with Diya, his granddaughter? Will he be able to even meet her? The last story explored in this book is The Heaven. It is the story of Prabhakaran aka Prabha. Despite living in the poor economic situation and having no father to take care for him and his mother, Prabha has the fire within to do something remarkable, for him and especially for his mother. Over the period of time, he realized that he is not that good at studies, but sports is his arena. A newly appointed teacher and his efforts to make their school better at sports resulted in having a remarkable tennis court in the school! Prabha worked really hard and guided genuinely by his coach started making his mark. He was sponsored by Shivi’s company, and Shivi started having a good emotional bond with the kid. The kid reached to the national level. However, on the day he was about to play the most important match of his life, something was changed for him! 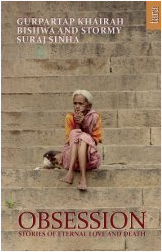 What was that and how it affected the lives of Prabha and his loved ones is explored in the rest of the story. I’ve started reading the book without many expectations and I am glad that I read this book. It is amazing! The stories explored are inspirational, motivational, philosophical and most of the things/acts suggested in the book are doable in real life. The stories deliver fantastic life lessons without making you realize. The author seems to have mastered the art of wrapping the message in swea et and adorable way. It is tough to avoid spoilers, especially for short story collections when you actually refer all the stories from the collection. While talking in depth about good/weak attributes, you tend to give away some insights to the stories, so I will try to avoid as many spoilers as possible, but, please read with the consent that some of them can possibly be there! The author comes up with nice and interesting names for the characters. Anustup, is the one I liked the most. It refers to a way of weaving words and most of the Bhagavad Gita is written in this Chhanda. Abhi’s face became paler than the interviewer’s beard. His red eyes with the slow catwalk confirm his excessive indulgence of vodka on duty. at this juncture, expecting machinery data from him would be like expecting expenditure data from your wife after shopping. Son, the same sentence has different meanings at different phases of one’s life. Son, today the world has too many opportunities to hold onto, but unfortunately, two hands are never enough. You better hold on to one thing tight before looking at others. Education is a way to know things and passion comes from creating things, with or without knowledge. Study you before you study anything. I would say too much education has left with a narrow imagination. You believe things should be well defined to the world otherwise it is wrong. However, in reality, it is not the truth but it is a manmade illusion. Once you are enslaved to these set of rules and beliefs, you will miss out on the beauty of life. … some people condition their mind and in most cases the mind conditions the people. There is no point in wasting time over things for which shortcuts are available. In that case, don’t wait for an ideal time but make any time ideal for you. Why not? When it happens to everybody it can happen to you as well! … Today’s strength and patience can help you face tomorrow. Don’t fear about things over which you don’t have control. Of course, you need to understand the context in which the lines are written. Here is a sarcastic line, which, if you don’t know the context and until you read the complete conversation, may find offending; which actually it is not. Girlfriends can come any time but the early morning sleep can come only n the early mornings. Do the right things at the right time and do only your things. Life’s successes do not depend on how fast you run but in which direction you run. You must be thinking that I am buying them happiness, but believe me, I am not. It is actually them who are getting happiness for free. The more positive one gets, the more powerful he becomes to attract goodness in his life. I like the conversation about Mahatma Gandhi in the book, and it is tough for me to not to mention it here. I will suggest you to not to miss it when reading the book. … in life there are a few well-wishers who always feel happy when you win and sad when you lose, but there were people who wanted you to lose. As long as you are a loser, you will be liked and supported. but when you supersede them, their attitude towards you will change. I told them that as kids they might not be exposed to the harsh realities of life but they should always remember that life is not always as smooth as they believe. So they should always be fully prepared to win but they must also be ready to face defeat as well. Again, you need to read it in the context to understand it fully. These quotes from the book must have given you the idea about the quality of its content and the type of writing you can expect from the book. The last story of the book is not as good as expected. It is quite different and “the end” of the same disappointed me. While this story is good at the beginning, the things got spoiled after it reaches halfway. Of course, it may not be the case for you. The conclusive chapter is also a little disappointing to me. The way, the author has tried connecting the dots is good but I am not convinced. I found some loose ends as well. Also, in order to represent the modern world, and the way of living, especially of the youth, the author used cuss words at places. I know that there is a segment of readers which will accept it wholeheartedly but personally I didn’t like it. It makes the book’s target audience limited, as far as my opinion is concerned. As part of book promotion, the kindle edition is available just for INR 49 (on Amazon India) and USD 0.69 (on Amazon US), so if you love reading EBooks, possibly this is the right time to purchase it. A book which proves to be a surprisingly good reading experience. While it has its letdowns, the strengths are much more than that, and it makes the book definitely worth to go for. It conveys the “hard” life-lessons in the “soft” way!